Jonathan's Birding Blog: Vis-migging- Rainham twinned with Numpties, Spurn? Vis-migging- Rainham twinned with Numpties, Spurn? Migration in evident at Rainham RSPB on walking down to the Serin Mound on Saturday morning with Chaffinches, Skylarks and Meadow Pipits moving through west. Most were up high and some silent. Variety was provided by a group of Redpoll and back near the centre a group of 6 calling Tree Sparrows shot by (local rarity). Vis-miggers stationed at the bottom of the ramp were logging the birds and a Short-eared Owl entertained on occasion when spooked from the centre of the marsh by corvids or an adult male Marsh Harrier. 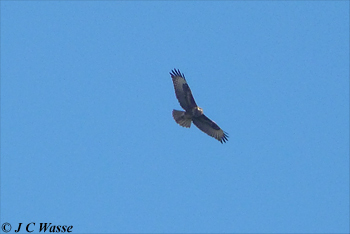 Into the afternoon it was becoming evident that Common Buzzards were moving through singles or in groups, with the largest being a group of 7, and lesser numbers of Sparrowhawks. The star was way out west from the watch point, namely whilst watching a pale Buzzard over Wennington Marsh PS picked out a ringtail Harrier heading strongly north-east from over that area. 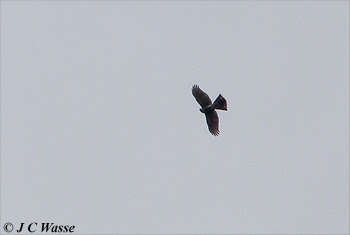 Scoping it revealed it to be a Hen Harrier with the warm underparts and small size suggesting imm. male. It was good that several folk got onto it as this beauty was heading out of town at a fair pace. A return visit on Sunday saw a group of us (AT, RB, PS and myself) head down the riverwall. Aveley Bay was quiet so encouraged by AT we carried on to Serin Mound mindful of Cattle Egrets recently reported (a day or so ago?) a few miles east at Thurrock. Setting up the scope on the mound mid morning and I soon picked up a small Egret flying from the south-west corner heading out towards the A13 flyover. First noted all dark legs and feet (which looked strikingly black). This set alarm bells ringing and I quickly noted that the wings appeared rounded and then straight onto the bill, it was short. As the bird was flying away only when it turned right to head east towards the reserve did it reveal details of the bill - a short orange bill. I quickly got the others onto it and it looked like it was heading out east but turned around and landed by Aveley Pools. All were happy on its 'id' and news was put out over the radio, text and Twitter airwaves. It wasn't settled as soon afterwards it took off and landed back on Wennington Marsh by a distant group of cattle, where it showed well but distant for a bit, then viewing was obscured by the vegetation as it moved at the feet of the cattle. 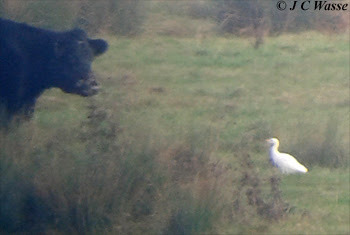 After a while and with this bird still out of sight, a Cattle Egret was picked with a more distant group of cattle. We watched it for a while and then established that 2 birds present, confirmed by others later in the morning. FS arrived quickly by cycle power and was one of many who could share in this sighting during the day. On leaving and by the Aveley Bay car park AT got onto 3 Egrets in front of us heading fast downriver. 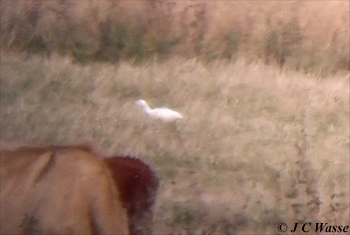 We scoped them, 3 Great White Egrets and watched them flying east and lost to view beyond the RSPB visitors centre. Found out that others at the centre were able to see them fly by as well. 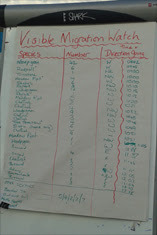 Not a bad tally, but it took me an hour to add the commonplace Little Egret to the day list! Caught up with one of the Cattle Egrets (flight view) in the afternoon in the company of a Little Egret near Aveley Pools. Other highlights include the cracking male Marsh Harrier and a distant big Peregrine over the Silts. A Kestrel mobbing it looked tiny by comparison, a brave/foolish Kestrel!